I hope you enjoyed all of the projects I made for the Stamp of Approval release. If you didn't purchase a box yet, you better hurry. There's only about 10% left!!! Just because release week has ended, that doesn't mean I don't have more cards to share. Like I said the other day, I'm on a mission to make more "boy" cards. It's been so nice to have a bunch on hand for my kids to choose from for birthday parties and I'm actually starting to enjoy this type of card making. It's a bit different from what I usually make (flowers, flowers and more flowers) and it's a good challenge for me to come up with things that boys will like. Here I did some double stenciling with Distress inks, then filled in some of the spaces with a stamped image. When I think boy cards, I think simple, less is definitely more. They like cool techniques and graphic images. So that's what I tried to achieve here. I'm a bit obsessed with the chalkboard technique lately (just scroll down one page of my blog and that will become very apparent ;) so bare with me! I noticed this card in the project PDF that I received yesterday and I absolutely love it. Cannot wait for my box to arrive, but I'm afraid I will need a little patience, since I'm located in Greece. I LOVE this card so much! 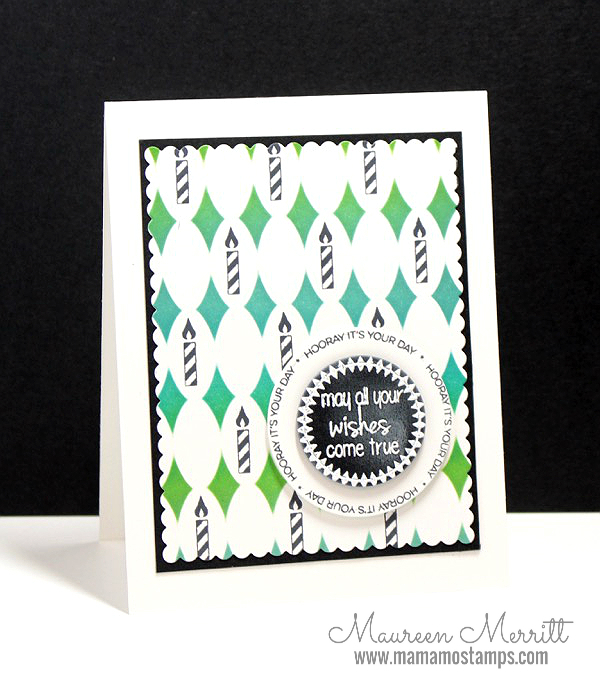 I was inspired to CASE the background with the stencil and candle stamp to create a shaker card. :) Will be sharing soon. Wow, Maureen, definitely CASEworthy!! Love that background choice and the chalkboard look too! Yep, guys are much more simple than girls are, right? Teehee!